Look at the drill hole. Natural pearls are valued by their weight, so if you see a very tiny hole this may indicate that they are natural – drilling as small a hole as possible minimises loss of weight. Natural pearls will be creamy in colour and generally smaller in size that cultured pearls. You can also use ultra violet light to assess the colour of the pearls – natural pearls will appear tan or yellow under this light. 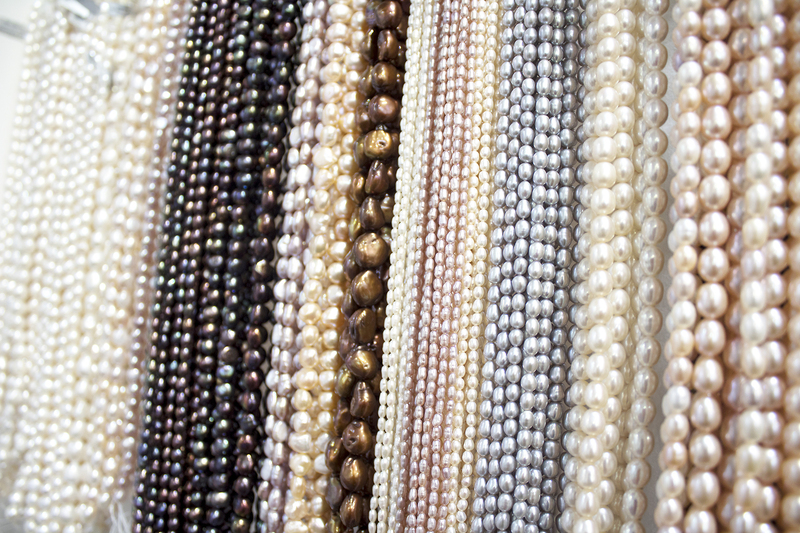 In addition, uniformity can be assessed: natural pearls are ‘found’ and created solely by nature – meaning there will always be variation in colours and shapes unless particularly fine, and a row will almost certainly always be graduated. The only other definitive way of finding out if a pearl is natural and to gain documentation is to send it to a lab for x-ray. By contrast a row of cultured pearls will have been carefully selected and matched so will be very uniform in colour, shape and size. The drill holes will be larger, and at closer inspection you may be able to see the line dividing the bead nucleus (that has been inserted by humans) and the layer of nacre – this line i s called the demarcation line. Under an ultra violet light these pearls will appear milky and almost a bluish colour. A fibre optic light could also be used here – holding it in direct contact with the pearl you may see parallel lines which is from the inside of the man-made nucleus that has been inserted. Of course, only nucleated pearls will show some of these signs – many freshwater pearls for instance will only have had a piece of flesh inserted to start the process of pearl production. Synthetic pearls will look ‘perfect’. They will be blemish free, and perfectly match each other. They will not have the beautiful lustre that natural and cultured pearls have because they do not have layers of nacre that reflect light. 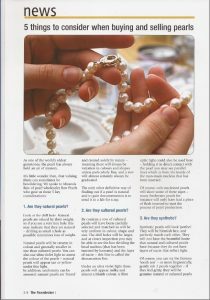 And of course, you can try the famous ‘tooth test’ – or more hygienically, gently rub 2 pearls together – if they feel gritty, they will be genuine natural or cultured pearls – however if they slip right off one another and are smooth then the chances are they are synthetic. These ‘pearls’ will also likely feel a great deal lighter than cultured and natural pearls. What is their condition like? Obviously, you may want to be able to re-sell the item, so you will be looking for quality. The key factors to consider when assessing the condition of a pearl are; size, shape, colour, lustre, surface quality, nacre quality and matching. Pearls are organic gems so should have been well cared for. Chemical substances such as perfume and make-up will eventually damage the surface of the pearls. Flaking and discolouration are signs they have not been cared for. In addition, though, this may mean they were not good quality pearls in the first place, with a very thin layer of nacre. Have a pearl expert in your corner! 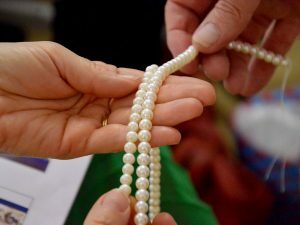 Unfortunately, there is no universally applied grading system for pearls, and all that is available are guidelines, and most importantly, experience. 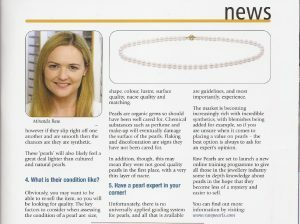 The market is becoming increasingly rich with incredible synthetics, with blemishes being added for example, so if you are unsure when it comes to placing a value on pearls – the best option is always to ask for an expert’s opinion.